Ensure accuracy when prescribing, dispensing, and administering Oxycodone Hydrochloride Oral Solution. Dosing errors due to confusion between mg and mL, and other oxycodone hydrochloride oral solutions of different concentrations can result in accidental overdose. [see Dosage and Administration (2.1), Warnings and Precautions (5.1)]. Oxycodone Hydrochloride Oral Solution exposes users to risks of addiction, abuse, and misuse, which can lead to overdose and death. Assess patient’s risk prior to prescribing Oxycodone Hydrochloride Oral Solution, and monitor all patients regularly for the development of these behaviors and conditions. [see Warnings and Precautions (5.2)]. 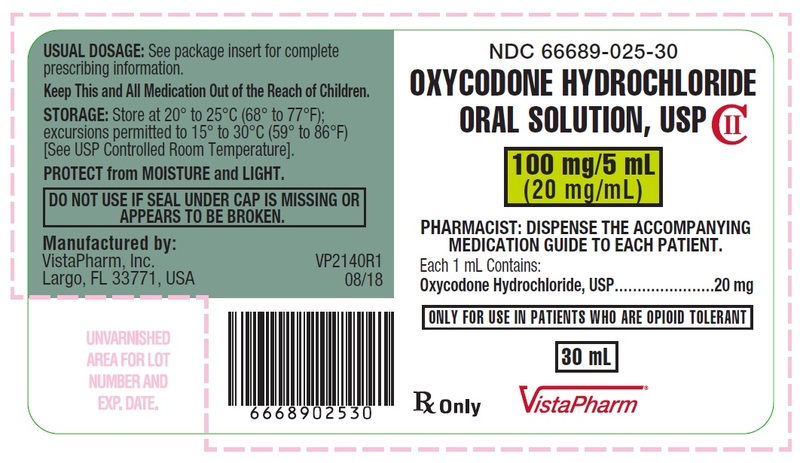 Serious, life-threatening, or fatal respiratory depression in may occur with use of Oxycodone Hydrochloride Oral Solution. Monitor for respiratory depression, especially during initiation of Oxycodone Hydrochloride Oral Solution or following a dose increase. [see Warnings and Precautions (5.4)]. Accidental ingestion of even one dose of Oxycodone Hydrochloride Oral Solution, especially by children, can result in a fatal overdose of oxycodone. [see Warnings and Precautions (5.4)]. Prolonged use of Oxycodone Hydrochloride Oral Solution during pregnancy can result in neonatal opioid withdrawal syndrome, which may be life-threatening if not recognized and treated, and requires management according to protocols developed by neonatology experts. If opioid use is required for a prolonged period in a pregnant woman, advise the patient of the risk of neonatal opioid withdrawal syndrome and ensure that appropriate treatment will be available. [see Warnings and Precautions (5.5)]. The concomitant of Oxycodone Hydrochloride Oral Solution with all cytochrome P450 3A4 inhibitors may result in an increase in oxycodone plasma concentrations, which could increase or prolong adverse reactions and may cause potentially fatal respiratory depression. In addition, discontinuation of a concomitantly used cytochrome P450 3A4 inducer may result in an increase in oxycodone plasma concentration. Monitor patients receiving Oxycodone Hydrochloride Oral Solution and any CYP3A4 inhibitor or inducer. [see Warnings and Precautions (5.6), Drug Interactions (7), Clinical Pharmacology (12.3)]. Reserve concomitant prescribing Oxycodone Hydrochloride Oral Solution and benzodiazepines or other CNS depressants for use in patients for whom alternative treatment options are inadequate. To report SUSPECTED ADVERSE REACTIONS, contact VistaPharm, Inc. at 1-888-655-1505 or FDA at 1-800-FDA-1088 or www.fda.gov/medwatch. 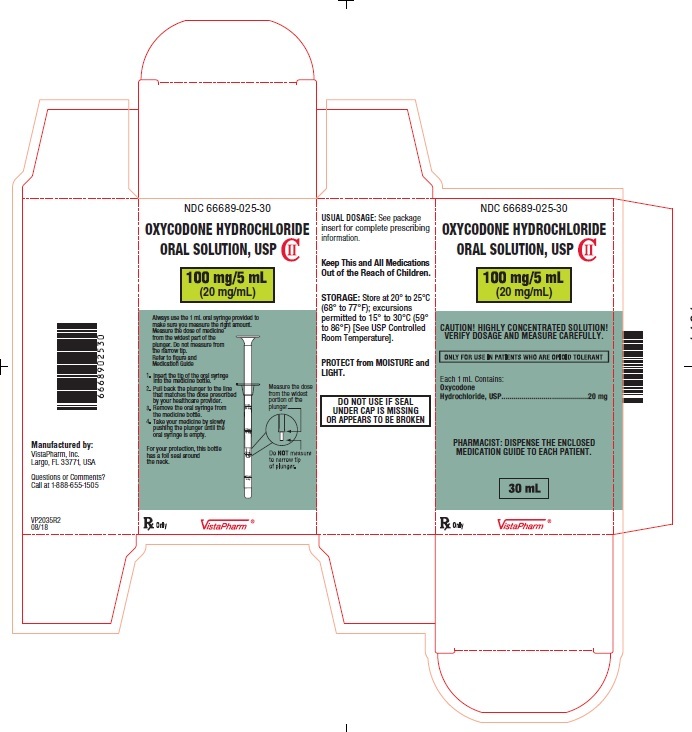 Ensure accuracy when prescribing, dispensing, and administering Oxycodone Hydrochloride Oral Solution to avoid dosing errors due to confusion between mg and mL, and other oxycodone hydrochloride solutions of different concentrations, which could result in accidental overdose and death. Ensure the proper dose is communicated and dispensed. When writing prescriptions, include both the total dose in mg and the total dose in volume. Always use the enclosed 1 mL calibrated oral syringe when administering Oxycodone Hydrochloride Oral Solution 100 mg per 5 mL (20 mg per mL) to ensure that the dose is measured and administered accurately. Monitor patients closely for respiratory depression, especially within the first 24-72 hours of initiating therapy and following dosage increases with Oxycodone Hydrochloride Oral Solution and adjust the dosage accordingly [see Warnings and Precautions (5.4)]. Initiate treatment with Oxycodone Hydrochloride Oral Solution in a dosing range of 5 to 15 mg every 4 to 6 hours as needed for pain. There is inter-patient variability in the potency of opioid drugs and opioid formulations. Therefore, a conservative approach is advised when determining the total daily dosage of Oxycodone Hydrochloride Oral Solution. It is safer to underestimate a patient’s 24-hour Oxycodone Hydrochloride Oral Solution dosage than to overestimate the 24-hour Oxycodone Hydrochloride Oral Solution dosage and manage an adverse reaction due to overdose. The relative bioavailability of Oxycodone Hydrochloride Oral Solution compared to extended-release oxycodone is unknown, so conversion to extended-release tablets must be accompanied by close observation for signs of excessive sedation and respiratory depression. Individually titrate Oxycodone Hydrochloride Oral Solution to a dose that provides adequate analgesia and minimizes adverse reactions. Continually reevaluate patients receiving Oxycodone Hydrochloride Oral Solution to assess the maintenance of pain control and the relative incidence of adverse reactions, as well as monitoring for the development of addiction, abuse, or misuse [see Warnings and Precautions (5.2)]. When a patient who has been taking Oxycodone Hydrochloride Oral Solution regularly and may be physically dependent no longer requires therapy with Oxycodone Hydrochloride Oral Solution, taper the dose gradually, by 25% to 50% every 2 to 4 days, while monitoring carefully for signs and symptoms of withdrawal. If the patient develops these signs or symptoms, raise the dose to the previous level and taper more slowly, either by increasing the interval between decreases, decreasing the amount of change in dose, or both. Do not abruptly discontinue Oxycodone Hydrochloride Oral Solution in a physically-dependent patient [see Warnings and Precautions (5.14), Drug Abuse and Dependence (9.3)]. 100 mg per 5 mL (20 mg per mL) Strength Oral Solution: Each 5 mL of orange Oxycodone Hydrochloride Oral Solution, USP contains oxycodone hydrochloride 100 mg.
Dosing errors can result in accidental overdose and death. Avoid dosing errors that may result from confusion between mg and mL and confusion with oxycodone hydrochloride solutions of different concentrations, when prescribing, dispensing, and administering Oxycodone Hydrochloride Oral Solution. Ensure that the dose is communicated clearly and dispensed accurately. Always use the enclosed calibrated 1 mL oral syringe when administering Oxycodone Hydrochloride Oral Solution 100 mg per 5 mL (20 mg per mL) to ensure the dose is measured and administered accurately. Do not use a teaspoon or a tablespoon to measure a dose. A household teaspoon or tablespoon is not an adequate measuring device. Given the inexactitude of the household spoon measure and the possibility of using a tablespoon instead of a teaspoon, which could lead to overdosage, it is strongly recommended that, if the enclosed calibrated measuring oral syringe becomes lost, caregivers obtain and use a calibrated measuring device. Health care providers should recommend a calibrated device that can measure and deliver the prescribed dose accurately, and instruct caregivers to use extreme caution in measuring the dosage. Complete a REMS compliant education program offered by an accredited provider of continuing education (CE) or another education program that includes all the elements of the FDA Education Blueprint for Health Care Providers Involved in the Management or Support of Patients with Pain. responsibilities. To obtain further information on the opioid analgesic REMS and for a list of accredited REMS CME/CE, call 1-800-503-0784, or log on to www.opioidanalgesicrems.com. The FDA Blueprint can be found at www.fda/gov/OpioidAnalgesicREMSBlueprint. Accidental ingestion of even one dose of Oxycodone Hydrochloride Oral Solution, especially by children, can result in respiratory depression and death due to an overdose of oxycodone. Advise both patients and caregivers about the risks of respiratory depression and sedation when Oxycodone Hydrochloride Oral Solution are used with benzodiazepines or other CNS depressants (including alcohol and illicit drugs). Advise patients not to drive or operate heavy machinery until the effects of concomitant use of the benzodiazepine or other CNS depressant have been determined. Screen patients for risk of substance use disorders, including opioid abuse and misuse, and warn them of the risk for overdose and death associated with the use of additional CNS depressants including alcohol and illicit drugs [see Drug Interactions (7) and Patient Counseling Information (17)]. Monitor such patients closely, particularly when initiating and titrating Oxycodone Hydrochloride Oral Solution and when Oxycodone Hydrochloride Oral Solution is given concomitantly with other drugs that depress respiration [see Warnings and Precautions (5.6)]. Alternatively, consider the use of non-opioid analgesics in these patients. When discontinuing Oxycodone Hydrochloride Oral Solution in a physically-dependent patient, gradually taper the dosage [see Dosage and Administration (2.4)]. Do not abruptly discontinue Oxycodone Hydrochloride Oral Solution in these patients [see Drug Abuse and Dependence (9.3)]. In all patients for whom dosing information was available (n=191) from the open-label and double-blind studies involving another formulation of immediate-release oxycodone, the following adverse events were recorded in oxycodone treated patients with an incidence ≥ 3%. In descending order of frequency, they were: nausea, constipation, vomiting, headache, pruritus, insomnia, dizziness, asthenia, and somnolence. If concomitant use is necessary, consider increasing the Oxycodone Hydrochloride Oral Solution dosage until stable drug effects are achieved. Monitor for signs of opioid withdrawal. If a CYP3A4 inducer is discontinued, consider Oxycodone Hydrochloride Oral Solution dosage reduction and monitor for signs of respiratory depression. The concomitant use of opioids with other drugs that affect the serotonergic neurotransmitter system has resulted in serotonin. The safety and effectiveness and the pharmacokinetics of Oxycodone Hydrochloride Oral Solution in pediatric patients below the age of 18 have not been established. Respiratory depression is the chief risk for elderly patients treated with opioids, and has occurred after large initial doses were administered to patients who were not opioid-tolerant or when opioids were co-administered with other agents that depress respiration. Titrate the dosage of Oxycodone Hydrochloride Oral Solution slowly in geriatric patients and monitor closely for signs of central nervous system and respiratory depression [see Warnings and Precautions (5.8)]. Since oxycodone is extensively metabolized in the liver, its clearance may be decreased in patients with hepatic impairment. Initiate therapy in these patients with a lower than usual dosage of Oxycodone Hydrochloride Oral Solution and titrate carefully. Monitor closely for adverse events such as respiratory depression, sedation, and hypotension [see Clinical Pharmacology (12.3)]. Information from oxycodone tablets indicate that patients with renal impairment had higher plasma concentrations of oxycodone than subjects with normal renal function. Initiate therapy with a lower than usual dosage of Oxycodone Hydrochloride Oral Solution and titrate carefully. Monitor closely for adverse events such as respiratory depression, sedation, and hypotension [see Clinical Pharmacology (12.3)]. Physical dependence may result in withdrawal symptoms after abrupt discontinuation or a significant dosage reduction of a drug. Withdrawal may also be precipitated through the administration of drugs with opioid antagonist activity (e.g., naloxone, nalmefene), mixed agonist/antagonist analgesics (e.g., pentazocine, butorphanol, nalbuphine), or partial agonists (e.g., buprenorphine). Physical dependence may not occur to a clinically significant degree until after several days to weeks of continued opioid usage. Oxycodone Hydrochloride Oral Solution should not be abruptly discontinued in a physically-dependent patient [see Dosage and Administration (2.4)]. If Oxycodone Hydrochloride Oral Solution is abruptly discontinued in a physically-dependent patient, a withdrawal syndrome may occur. Some or all of the following can characterize this syndrome: restlessness, lacrimation, rhinorrhea, yawning, perspiration, chills, myalgia, and mydriasis. Other signs and symptoms also may develop, including irritability, anxiety, backache, joint pain, weakness, abdominal cramps, insomnia, nausea, anorexia, vomiting, diarrhea, or increased blood pressure, respiratory rate, or heart rate. In case of overdose, priorities are the reestablishment of a patient and protected airway and institution of assisted or controlled ventilation, if needed. Employ other supportive measures (including oxygen and vasopressors) in the management of circulatory shock and pulmonary edema as indicated. Cardiac arrest or arrhythmias will require advanced life-support techniques. Oxycodone Hydrochloride Oral Solution is an agonist, available as a clear orange solution 100 mg/5 mL (20 mg/mL) for oral administration. The chemical name is (5R,9R,13S,14S)-4, 5α-epoxy-14-hydroxy-3-methoxy-17-methylmorphinan-6-one hydrochloride. The molecular weight is 351.82. 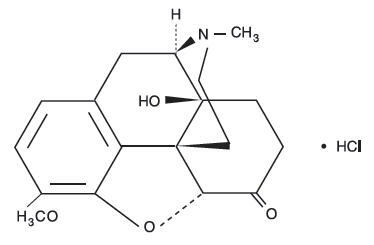 Its molecular formula is C18H21NO4.HCl, and it has the following chemical structure. Oxycodone Hydrochloride is a white, odorless crystalline powder derived from the opium alkaloid, thebaine. It is soluble in water and slightly soluble in alcohol. The inactive ingredients in Oxycodone Hydrochloride Oral Solution 100 mg per 5 mL (20 mg/mL) include: citric acid anhydrous, FD&C Yellow # 6, purified water, saccharin sodium, sodium benzoate. Opioids inhibit the secretion of adrenocorticotropic hormone (ACTH, cortisol), and luteinizing hormone (LH) in humans [see Adverse Reactions (6)]. They also stimulate prolactin, growth hormone (GH) secretion, and pancreatic secretion of insulin and glucagon. The activity of oxycodone hydrochloride is primarily due to the parent drug oxycodone. About 60 to 87% of an oral dose reaches the systemic circulation in comparison to a parenteral dose. This high oral bioavailability (compared to other opioids) is due to lower pre-systemic and/or first-pass metabolism of oxycodone. When oxycodone capsules are administered with a high-fat meal, mean AUC values are increased by 23% and peak concentrations are decreased by 14%. Food causes a delay in Tmax (1.00 to 3 hours). Similar effects of food are expected with the oral solution. Following intravenous administration, the volume of distribution (Vss) for oxycodone was 2.6 L/kg. Plasma protein binding of oxycodone at 37°C and a pH of 7.4 was about 45%. Oxycodone has been found in breast milk. Oxycodone hydrochloride is extensively metabolized by multiple metabolic pathways to noroxycodone, oxymorphone, and noroxymorphone, which are subsequently glucuronidated. CYP3A4 mediated N-demethylation to noroxycodone is the primary metabolic pathway of oxycodone with a less contribution from CYP2D6 mediated O-demethylation to oxymorphone. Therefore, the formation of these and related metabolites can, in theory, be affected by other drugs. The major circulating metabolite is noroxycodone with an AUC ratio of 0.6 relative to that of oxycodone. Noroxycodone is reported to be a considerably weaker analgesic than oxycodone. Oxymorphone, although possessing analgesic activity, is present in the plasma only in low concentrations. The correlation between oxymorphone concentrations and opioid effects was much less than that seen with oxycodone plasma concentrations. The analgesic activity profile of other metabolites is not known. Oxycodone and its metabolites are excreted primarily via the kidney. The amounts measured in the urine have been reported as follows: free oxycodone up to 19%; conjugated oxycodone up to 50%; free oxymorphone 0%; conjugated oxymorphone < 14%; both free and conjugated noroxycodone have been found in the urine but not quantified. The total plasma clearance was 0.8 L/min for adults. Apparent elimination half-life of oxycodone following the administration of oxycodone is approximately 4 hours. Information obtained from oxycodone tablets indicate that the plasma concentrations of oxycodone did not appear to be increased in patients over the age of 65. Because oxycodone is extensively metabolized in the liver, its clearance may decrease in hepatic-impaired patients. A dose adjustment is recommended in these patients [see Use in Specific Populations (8.6)]. Because this drug is known to be substantially excreted by the kidney, and the risk of adverse reactions to this drug may be greater in patients with impaired renal function, a dose reduction is recommended for renal impaired patients [see Use in Specific Populations (8.7)]. Oxycodone hydrochloride was genotoxic in an in vitro mouse lymphoma assay in the presence of metabolic activation. There was no evidence of genotoxic potential in an in vitro bacterial reverse mutation assay (Salmonella typhimurium and Escherichia coli) and in an assay for chromosomal aberrations (in vivo mouse bone marrow micronucleus assay). Store at Controlled Room Temperature, 20° to 25°C (68° to 77°F); excursion permitted between 15° to 30°C (59° to 86°F). [See USP Controlled Room Temperature]. Advise patients that Oxycodone Hydrochloride Oral Solution, is available in one concentration (100 mg/5 mL). Inform patients about the concentration they have been prescribed. Instruct patients how to measure and take the correct dose of Oxycodone Hydrochloride Oral Solution and to always use the enclosed calibrated oral syringe when administering Oxycodone Hydrochloride Oral Solution 100 mg per 5 mL (20 mg/mL) to ensure the dose is measured and administered accurately [see Warnings and Precautions (5.1)]. Inform patients that accidental ingestion, especially by children, may result in respiratory depression or death [see Warnings and Precautions (5.4)]. Instruct patients to take steps to store Oxycodone Hydrochloride Oral Solution securely and to dispose of unused Oxycodone Hydrochloride Oral Solution by flushing down the toilet. Inform patients and caregivers that potentially fatal addictive effects may occur if Oxycodone Hydrochloride Oral Solution is used with benzodiazepines or other CNS depressants, including alcohol, and not to use these concomitantly unless supervised by a health care provider [see Warnings and Precautions (5.7), Drug Interactions (7)]. Inform patients to avoid taking Oxycodone Hydrochloride Oral Solution while using any drugs that inhibit monoamine oxidase. Patients should not start MAOIs while taking Oxycodone Hydrochloride Oral Solution [see Drug Interactions (7)]. Advise patients to always use the enclosed calibrated oral syringe when administering Oxycodone Hydrochloride Oral Solution to ensure the dose is measured and administered accurately [see Warnings and Precautions (5.1)]. Advise patients not to adjust the dose of Oxycodone Hydrochloride Oral Solution without consulting with a physician or other healthcare provider. Inform patients that anaphylaxis has been reported with ingredients contained in Oxycodone Hydrochloride Oral Solution. Advise patients how to recognize such a reaction and when to seek medical attention [see Adverse Reactions (6)]. Inform female patients of reproductive potential that Oxycodone Hydrochloride Oral Solution can cause fetal harm and to inform the healthcare provider of a known or suspected pregnancy [see Use in Specific Populations (8.1)]. See the detailed Instructions for Use for information about how to take Oxycodone Hydrochloride Oral Solution 100 mg per 5 mL (20 mg per mL). Always use the enclosed calibrated oral syringe that comes with Oxycodone Hydrochloride Oral Solution 100 mg per 5 mL (20 mg per mL) to correctly measure your dose. Never use a household teaspoon or tablespoon to measure Oxycodone Hydrochloride Oral Solution. After you stop taking Oxycodone Hydrochloride Oral Solution, destroy the unused solution by flushing down the toilet. These are not all the possible side effects of Oxycodone Hydrochloride Oral Solution. Call your doctor for medical advice about side effects. You may report side effects to FDA at 1-800-FDA-1088. For more information, go to dailymed.nlm.nih.gov or contact VistaPharm, Inc. at 1-888-655-1505. Always use the 1 mL oral syringe provided with your Oxycodone Hydrochloride Oral Solution to make sure you measure the right amount. 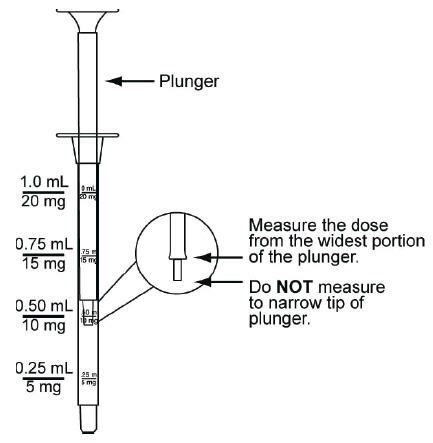 Measure the dose of medicine from the widest part of the plunger.Do not measure from the narrow tip.See Figure 1. Step 1. Insert the tip of the oral syringe into the medicine bottle. Step 2. Pull back the plunger to the line that matches the dose prescribed by your healthcare provider. Step 3. Remove the oral syringe from the medicine bottle. Step 4. Take your medicine by slowly pushing the plunger until the oral syringe is empty. VERIFY DOSAGE AND MEASURE CAREFULLY.